. : Optics & Photonics Focus :: Spooky Light :. Shining light on a rat’s brain. This image is representative of the experiment preformed by Johansen and colleagues, where a specific region in a live rat’s brain was illuminated with laser light via an optical fiber. Nearly 100 years ago, Russian psychologist and Nobel Laureate Ivan Pavlov demonstrated that dogs could be conditioned to salivate at the sound of a bell, even though no food was in sight. Since then, many similar experiments have been performed, even on humans. Joshua Johansen and colleagues, working in the LeDoux Lab at the Center for Neural Science at New York University (New York, USA), are now able to directly stimulate specific neurons in the brain, thus leading to the same conditioning phenomenon that Pavlov observed… except they do so by using light! Classical conditioning occurs when a subject learns to respond to an innocuous stimulus with a specific behavior or physiological reaction inherently associated with an entirely different stimulus. Take Pavlov's dogs, for example: they were conditioned to salivate, typically a physiological response to the presence of food, simply at the sound of a bell. Traditionally, in this type of experiment a subject is repeatedly exposed to two stimuli nearly simultaneously: first a neutral one — the conditioned stimulus — followed by one that gives a behavioral or physiological response — the unconditioned stimulus. In the case of Pavlov's dogs, the conditioned stimulus was the bell and the unconditioned stimulus was the food. Although much can be learned from traditional conditioning experiments, the exact brain pathways involved cannot be deciphered. Johansen and colleagues’ goal was to shed light on these very pathways. Using a technique called optogenetics, they were able to directly stimulate specific neurons in a rat's brain and cause them to fire on command. This is done by genetically modifying the desired neurons to produce a special photoactivatable protein, namely a protein that actively responds to the presence of light. In this study, the direct activation of the rat’s neurons with light replaced the classical unconditioned stimulus. The work was focused on fear. Just as animals can be conditioned to salivate, they can also be conditioned to show fear. Fear is a very good system to study for two reasons. First, the behavioral and physiological reactions associated with it are relatively universal and easy to quantify. Second, understanding fear memory formation can be very helpful for the treatment of disorders such as Post Traumatic Stress Disorder (PTSD). PTSD is a condition characterized by a heightened emotional response to a common situation, as a result of a traumatic experience. Essentially, the traumatic experience (consider an explosion) conditions the person who experiences it to react to a similar loud noise (perhaps a glass that falls to the floor) as though that were an explosion. According to Johansen, "by understanding how aversive experiences can trigger fear memories and changes in brain connectivity we may be able to develop more effective treatments for PTSD which could undo these changes." Specifically, in Johansen and colleagues' study, lateral amygdala neurons in live rats were genetically modified to produce photoactivatable proteins. The lateral amygdala neurons were chosen because studies about the biological fear learning pathway had suggested that these neurons are integral for fear memory formation. By shining a laser on these neurons in the animal's brain, the researchers were able to directly force the cells to fire, mimicking a genuine fear response. "What is very clever about Johansen’s study is that instead of pairing a tone with a foot shock, they drove the cells in the lateral amygdala directly using light-activation. In this study, the animals learned to become afraid of the tone, even though they were never given a shock!" says Sheena Josselyn, a researcher at Sickkids and at the University of Toronto (Ontario, Canada). The study not only exemplifies that the technology exists to directly excite neurons within the brain using optics, but it also teaches us a lot about the physiology behind fear. This is, however, still a work in progress. Although the optogenetic approach used did strongly activate the lateral amygdala neurons, the fear learning response was not as strong as the response observed in more traditional experiments, where an electric shock is used. In order to better understand the fear learning pathway, Johansen and colleagues are currently working on a new experiment to test additional theories on fear memory formation. In their current work they are combining two simultaneous optogenetic stimulations: one to stimulate the lateral amygdala neurons and another to stimulate the secretion of a neurotransmitter. They believe that this will better simulate the fear learning pathway and, therefore, help confirm our understanding of how the brain works. 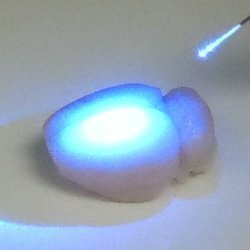 As this work shows, the coupling of optics and biology has potential beyond the common application of imaging; however, we should always evaluate an experimental technique not by its potential alone, but also by the results that it delivers. Josselyn concludes that this research has led to "an important finding, using cutting-edge techniques, that addresses a central issue of neuroscience — how and where learning occurs in the brain. The present paper is a step forward in our knowledge of how the brain learns about fearful stimuli." Optogentics is proving to be a very valuable tool in understanding biological pathways. Joshua P. Johansen, Hiroki Hamanaka, Marie H. Monfils, Rudy Behnia, Karl Deisseroth, Hugh T. Blair & Joseph E. LeDoux, Optical activation of lateral amygdala pyramidal cells instructs associative fear learning, PNAS (2010) 107, 12692–12697 (link).